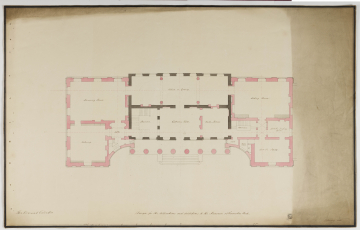 There are four (surviving) schemes from the Soane office for enlarging the house. All were concerned with the principal storey and relied on adding to each flank. Soane's part-sketch plan (drawing ) has a portico and this was developed in subsquent drawings with four columns becoming eight columns. The link between exisiting and new work seems best when done on an arc (drawings  and .